The Dubai shared services hub went live with its SAP S/4 Hana enterprise cloud solution as part of an ERP business transformation process, significantly enhancing financial reporting. Our responsible corporate citizen philosophy encapsulates our inherent approach of conducting business ethically, with integrity and with commercial wisdom that strives to enhance the economic and social well-being of our patients, consumers, investors, employees, customers and business partners. We are committed to adopting a stakeholder inclusive governance approach and sustaining strong relationships with our stakeholders through transparency and effective communication. The Board takes overall responsibility for ensuring a stakeholder-inclusive governance approach and a Group stakeholder engagement policy is in place. During the year, we have had a wide range of structured and ad hoc engagements with our broad stakeholder base. Our approach to stakeholder engagement and a summary of the most material stakeholder engagements that we have undertaken is set out here. Led by an effective Board of Directors and long-serving, experienced executives, we operate on an established foundation of strong corporate governance. The King IV Report on Governance is implemented throughout the Group. More can be read about this in the abbreviated Corporate Governance report set out here. We have a zero-tolerance approach to unethical behaviour. Our Code of Conduct, signed by all permanent employees, governs the conduct of employees throughout the Group. Furthermore, our service providers and suppliers are required to adhere to the Aspen Code of Conduct for Suppliers and Service Providers in accordance with terms and conditions included in agreements with these stakeholders. A formalised ethics management programme has been implemented at all our businesses. This programme is managed by the Company Secretary & Group Governance Officer under the direction of the S&E Co. The Ethics Institute assessed our programme in 2016 and it was confirmed to be effective in all material respects. No material breaches of this code were identified during the period under review. We are committed to the fight against bribery and corruption. Our stance on bribery and corruption, as outlined in our Code of Conduct, is strengthened by our Anti-bribery and Anti-corruption policy, applicable to all our employees and our suppliers, service providers, consultants, agents or any third parties authorised to act on our behalf. This policy is aligned to the recommendations of the OECD on corruption and prohibits any employee or agent of Aspen from directly or indirectly offering, paying, soliciting or accepting bribes in any form. Read with our Gifts and Benefits policy, it also prohibits the acceptance or giving of gifts or hospitality that are not of a nominal value or participating in events sponsored by current or prospective customers or suppliers. We promote a culture of openness and transparency throughout the Group and, as such, employees and other stakeholders are encouraged to report unethical conduct and other transgressions of which they may become aware. An independently monitored whistle-blowing hotline, Deloitte's Tip-Offs Anonymous, has been made available to all our employees and allows other stakeholders to report suspected fraud and/or activities which are considered to be transgressions of our Code of Conduct. Our whistle-blower's policy and standard operating procedure provides guidance to prospective whistle-blowers and details the protections available to them, including protection against occupational detriment. Quarterly reports detailing the tip-offs received, how these tip-offs have been investigated and the corrective measures taken, are submitted to the A&R Co and S&E Co for consideration as appropriate. We are a signatory of the UN Global Compact and are committed to upholding the principles of respecting and protecting internationally proclaimed human rights, as well as ensuring that we are not complicit in human rights abuses. The Aspen Code of Conduct details our commitment to fundamental human rights and the S&E Co monitors the effectiveness of ethics management in the Group. All our suppliers and business partners are required to confirm acceptance of the Aspen Code of Conduct for Suppliers and Service Providers to provide assurance that human rights and good ethical standards are upheld within the supply chain. No businesses in the Group are deemed to be at risk of violating human rights which prevent child labour, slave or compulsory labour. 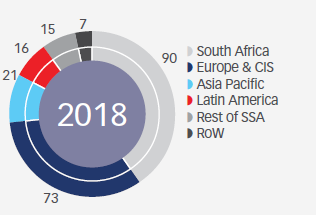 During the year, no incidents of discrimination, slave labour or compulsory labour were reported within the Group (2017: Nil). As part of our commitment to good corporate citizenship, we support the United Nations Declaration on the Rights of Indigenous Peoples as adopted on 13 September 2007 and respect the rights of indigenous peoples in the countries and territories in which we operate. There were no reported incidents where the rights of indigenous people were violated (2017: Nil). These aspects are monitored in respect of all business units. As a Group that has a substantial presence in many countries, we understand our responsibility to pay an appropriate amount of tax. We comply with tax laws in the countries in which we operate and seek to maintain open and positive relationships with tax authorities. The taxes we pay make a positive contribution to the societies in which we operate. Our approach to taxation is set out here. We do not make payments or other contributions to political parties, organisations or their representatives or take part in party politics. Lawful compliance and respect for the rule of law underpins an ordered and effective society. We are committed to complying with the applicable legal and regulatory requirements wherever we do business. The Group Legal & Compliance Officer is responsible for the implementation of an effective legislative compliance framework and provides the Board with assurance that the Group is compliant with applicable laws and regulations. No significant incidents of legislative infringements were recorded during the year reflecting effective compliance management and governance processes that were adhered to across the Group. The investigations opened by the European Commission and UK Competition and Markets Authority in May 2017 and October 2017 respectively to investigate certain pricing aspects related to specific Aspen products in Europe and the UK (refer to Summarised group supplementary information) are ongoing and we are fully cooperating with the respective investigation teams. No cases have been formally opened against Aspen at the date of publishing this report. Our SED programmes are implemented at a local level through the business units, thereby channelling contributions to areas of greatest impact in the particular local context. We are proud of our continued commitment to Mandela Day in which business units across our operations initiate projects that positively impact beneficiaries in the many communities in which we operate. 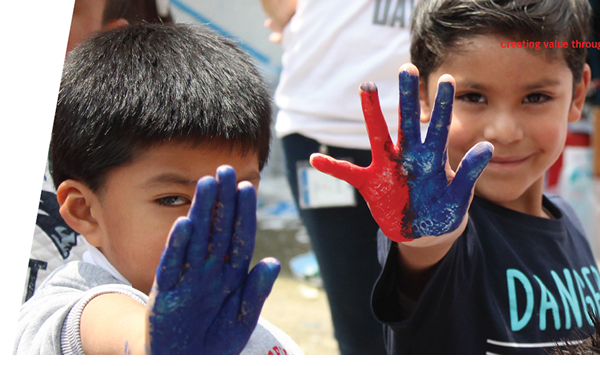 A detailed overview of our Mandela Day initiatives is available online. We supported a total of 222 SED projects during the year which were valued at R19,0 million, largely based in South Africa. In South Africa, we are committed to supporting initiatives that address the underdeveloped healthcare infrastructure, shortage of healthcare professionals and the long-term consequences of HIV/AIDS to the country's sustainability objectives. Our SED strategy, led by the Senior Executive: Strategic Trade & Development, is primarily aimed at utilising our social & relationship capital to promote initiatives that provide long-term solutions to the healthcare, education and HIV/AIDS issues in South Africa. contributions towards the establishment of the Health Leadership Academy, recently established by the Minister of Health, which will improve the skills of public sector hospital CEOs and build further management capacity in the public sector. To date, the PHEF has invested approximately R180 million in these initiatives. Following a tuberculosis campaign conducted in the North West province, the prevalence of cross-infection of tuberculosis among the children due to the absence of a quality Early Childhood Centre in the area was identified as an opportunity for us to assist. We initiated a project to build such a centre and, as a result, the Kanana Early Childhood Development Centre, which can accommodate 200 children, was completed in December 2017. The centre became fully operational from April 2018 after teachers were provided with additional early childhood developmental skills and appropriate furniture and playground equipment for the children was provided. Tygerberg Hospital is a tertiary hospital located in Bellville, Cape Town. This is the largest hospital in the Western Cape and the second largest hospital in South Africa. It acts as a teaching hospital in conjunction with the University of Stellenbosch Health Science Faculty. In partnership with the Carte Blanche Making A Difference Trust, we built a dedicated paediatric operating theatre at this hospital, which was officially opened in April 2018. The Motor Neuron Disease clinic, located at Chris Hani Baragwanath Academic Hospital, in honour of the late Joost van der Westhuizen, was officially opened in July 2018. We refurbished and painted the clinic and supplied equipment to improve the quality of life of the patients with this disease. We appreciate that our stakeholders expect us to report on a broad range of environmental, social and governance aspects in a consistent and transparent way. Since the implementation of the FTSE/JSE Responsible Investment Index in 2015, we have consistently improved our score to a score of 4,0 out of a possible 5,0 on the most recent assessment. As a proudly South African-based group, we support the country's transformation objectives aimed at empowering historically disadvantaged groups in South Africa and subscribe to the notion that, through the legislated economic empowerment initiatives, South Africa will benefit from the social reparation of past injustices and the added economic contribution of inclusive and unrestricted participation by all citizens. 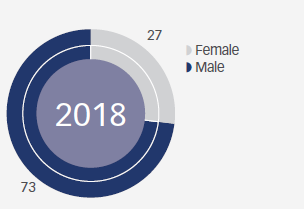 We have developed transformation objectives and programmes and our employee management policies in South Africa are aligned with the Employment Equity Act and the BBBEE Codes to promote the advancement of historically disadvantaged individuals and women. 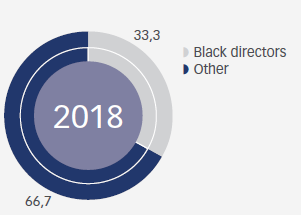 In light of the significance we place on achieving progress in this regard, a new KPI has been developed measuring the percentage of black employees in the top 50 positions in South Africa (Human capital). The attraction, retention and development of female employees is a priority for the Group and gender diversity is a key performance indicator monitored by the S&E Co. We recognise that the advancement of women within the organisational structures is an important element in addressing gender equity. 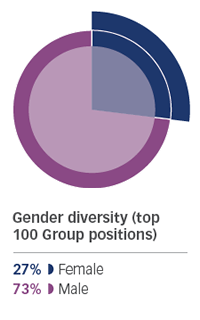 Accordingly, a new KPI measuring the percentage of women represented in the top 100 positions in the Group, has been introduced to allow more focused attention on our performance in this regard. In addition, enterprise development programmes and preferential procurement objectives and targets are in place to support the emergence of black-owned and black female-owned businesses. To this end, procurement initiatives include the identification of qualifying suppliers. Our total BEE procurement spend with empowering suppliers amounted to R4 010 million representing 76% of total measured procurement spend (2017: 81%). Our enterprise development and enterprise supplier development programmes have seen loans to the value of R54,5 million advanced to selected beneficiaries. The S&E Co monitors progress of the Group's transformational objectives on a regular basis. We have maintained our Level 4 contributor status for the year. The Group's BBBEE certification was performed by Empowerdex, an independent economic empowerment rating and research agency. The 2018 certificate can be accessed online.